S.S.R. 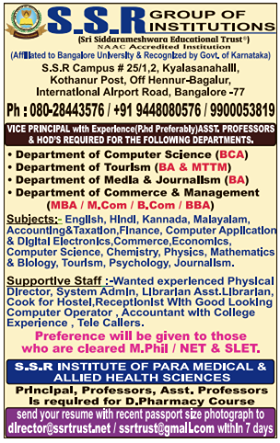 Group of Institutions, Bangalore has advertised in DECCAN HERALD newspaper for the recruitment of Assistant Professor plus HOD jobs vacancies. Interested and eligible job aspirants are requested to apply with in 7 days. Check out further more details below. About College: Realising the need for a value based quality education at the Pre-University UG and PG levels the Trust has established S.S.R Pre-University College and S.S.R College of Science and Management Studies in the year 2009-10. Within a short span of 2 years, both the colleges received very good encouragement from the students fraternity and parents.